Hi everyone! I have awesome news to share with you just in time for the holiday season. As you may already know, I love my frozen yogurt. 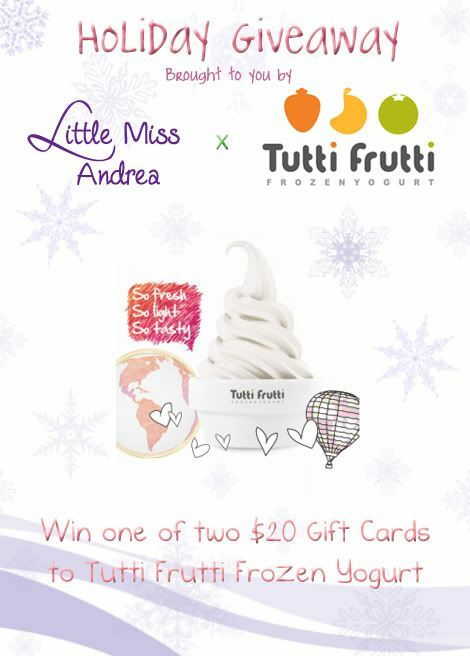 And I'm excited to announce to you today that I will be hosting a giveaway in partnership with Tutti Frutti in Edmonton to give away two prizes of $20 gift cards to my readers to be used at the Whyte Avenue location. In the spirit of giving for the holidays, I will be purchasing one gift card, and Tutti Frutti has offered to provide the second. Fantastic or what?! There are multiple ways for you to increase the odds of winning in this giveaway! You do not have to complete them all, just whichever you choose. Please enter all information in the form below for me to keep track of your entries! Otherwise, anything you do will not count. The first step must be completed to unlock the additional entries form. The contest will run until December 31/2011, 10:01 PM PST. It will be open to my readers living in Alberta (open to 18+ or with parental consent). Three weeks left, which is plenty of time for you to enter! I will personally be verifying all the entries, and the two winners will be chosen randomly after the contest is closed. Thank you so much for your support! Have fun entering & good luck! Happy Holidays! love your blog~!! and frozen yogourt! my fave flavours are always tart. i wanna see a mango frozen yogurt! I have yet to try all of the favours but so far, I like the blueberry and the taro. Love to see pineapple! Haven't seen it yet! my favourite is red velvet! MMMMM! I <3 FroYo! So good! Red Velvet blew my mind! I am soooo excited to try their new Chocolate Coffee Bean flavor!!!! I LOVE the holiday Gingerbread and hope they bring back watermelon!!! Coconut and lychee are definitely my favorite flavors. I love the raspberry froyo. Maybe pomegranate next? Hello dear! Great giveaway! THank you for your lovely comments. I am your new follower. Hope you will follow me back. I personally love tart and fruity fro' yo flavors, so the TF Tart, strawberry, raspberry, and lychee flavors have been my favorite so far. I'm looking forward to trying the holiday flavors, particularly the gingerbread, just because it's something different. What a cute giveaway is that?! It's really yummy! ♥ But I bet Tutti Frutti isn't here in Germany. Lisa above me said there aren't any frozen yoghurt in Germany but that's not right!! o: I have a few shops here in Berlin... but not Tutti Frutti so I cannot participate in this giveaway. my favourites so far were red velvet and lychee :) but i still have lots left to try! But I also have a giveaway this week myself, hope you will join in on the fun! Such a nice post, I enjoyed it a lot! I like your sense of style! Wonderful giveaway! @Palmarablog wants froyo! Yum Yum! I loooove the coconut and taro flavour! yuum! Second of all, I love you cake pops. Third of all, you're fantastic. Fourth of all, my favourite flavour is the strawberry or raspberry! Mmmm...I love Tutti Fruitti! Pineapple is my fav! Maango is probably my favorite.